Bengaluru: The long wait for the appointment of District in-Charge Ministers ended with Chief Minister H.D. Kumaraswamy (HDK) releasing the list last evening. The appointments were completed well ahead of the Independence Day as the in-Charge Ministers have to hoist the National Flag in their respective districts on Aug.15. As Kumaraswamy’s Ministry has just 27 Ministers with seven slots still vacant, some of the Ministers would have the privilege of heading two districts in the State which has a total of 30 districts. As expected, Higher Education Minister G.T. Devegowda (GTD) has been made in-charge of Mysuru district and Tourism and Sericulture Minister S.R. Mahesh will be Kodagu in-Charge Minister. The stiff fight between Transport Minister D.C. Thammanna and Minor Irrigation Minister C.S. Puttaraju to head Mandya district has been resolved and Puttaraju has bagged it. Thammanna has got Shivamogga. Backward Classes Welfare Minister C. Puttaranga Shetty will hold the authority over Chamarajanagar district and Public Works Minister H.D. Revanna will take charge of Hassan district. Deputy Chief Minister and Bengaluru Development Minister Dr. G. Parameshwara has been made in-charge of Bengaluru Urban and Tumakuru districts, while Water Resources Minister D.K. Shivakumar has been given the responsibility of Ramanagaram and Ballari districts. Rural Development and Panchayat Raj Minister Krishna Byre Gowda is in-charge of Bengaluru Rural and Kolar. Revenue Minister R.V. Deshpande Uttara Kannada and Dharwad districts, Industries Minister K.J. 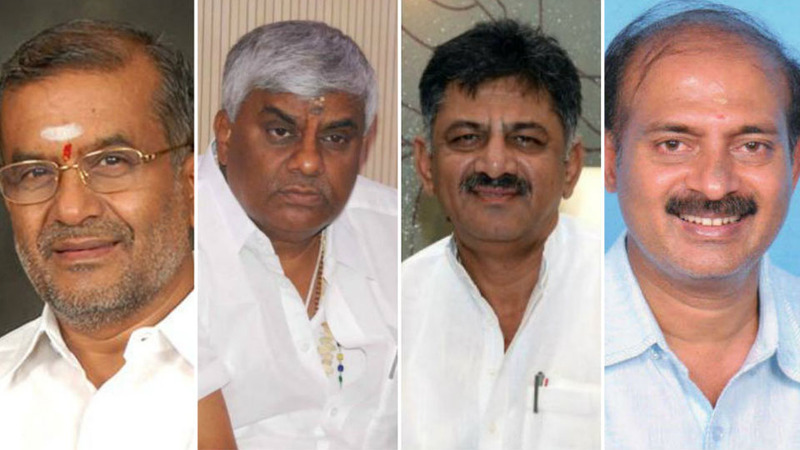 George Chikkamagaluru district, Minister for Municipal Administration Ramesh Jarakiholi Belagavi district, Health Minister Shivananda Patil Bagalkot district, Social Welfare Minister Priyank Kharge Kalaburagi district and Minister for Mines and Muzrai Rajashekar Patil will be Yadgir district Minister. Labour Minister Venkataramanappa will look after Chitradurga district, Agriculture Minister H.N. Shivashankar Reddy Chikkaballapura district, Housing Minister U.T. Khader Dakshina Kannada district, Food and Civil Supplies Minister B.Z. Zameer Ahmed Khan Haveri district, Women and Child Development Minister Jayamala Udupi district, Forest Minister R. Shankar Koppal district, Primary and Secondary Education Minister N. Mahesh Gadag district. Animal Husbandry Minister Venkatrao Nadagouda will be the in-charge of Raichur district, Small Scale Industries Minister S.R. Srinivas Davanagere district, Co-operation Minister Bandeppa Kashampur Bidar district and Horticulture Minister M.C. Managooli will be Vijayapura district Minister. Can you please answer why Schools & Colleges are facing such problems ? Take Mathrumandali School which has a glorious history of 100 years is nearing closing.Such a great Maharaja’s School associated with greats like RKNarayan,RKLaxman is about to be closed.The building is collapsing.Whatever GREAT MAHARAJAS OF MYSORE built is collapsing,like alwnsdowne bidg,Big Market etc. TAKE A DECISION TO CLOSE THE BIG MARKET & BUILD A NEW MARKET IN IT’S PLACE.The present building has outlived in its usefulness,& hence collapsing. The said schools are closing coz of poor attendance (in single digit). Its a catch 22 situation, Unless there is enough pupil; school can not run and Unless School runs, people wont come. Parents struggle a lot to give good education to their children.The Govt doesn’t spend on education.That is compensated by Parents.They pawn their belongings to see their children get good education.The poor like SC/ST send their children to convents at exorbitant fees.The rich ofcourse send their children to DOON SCHOOL.The net effect is schools are funnily named as KP CONVENT. What these parents do not realise is if the child is DUD,no convent can make him intelligent.The converse is if the child is naturally intelligent ,no Govt school can make him DUD. People prefer CONVENTS for lower education & prefer GOVT SCHOOLS/COLLEGES(IISc,IITs) for higher education.No private institutions are interested in higher education,because you can’t make money there. They will get the plans ready, sanction the budget, allot the funds and start some cosmetic works and then….. the same old Story like the Raaja Maarga.